Since the conference events will take place at several sites, you will have the opportunity to take a tour of the old city as you travel from one place to another. It’s a 10 -15 minute walk from one conference venue to the other. The Palace of the Grand Dukes of Lithuania – the reconstructed historical residence in the heart of Lithuania’s capital is the symbol of Lithuania’s longlived statehood and an object of national pride. It is a centre for civic education, historical consciousness-raising and appreciation of material culture, for state ceremonial events and tourist information. Lithuanian Academy of Music and Theatre (LMTA) is beautifully situated in the centre of Vilnius and currently has some buildings. 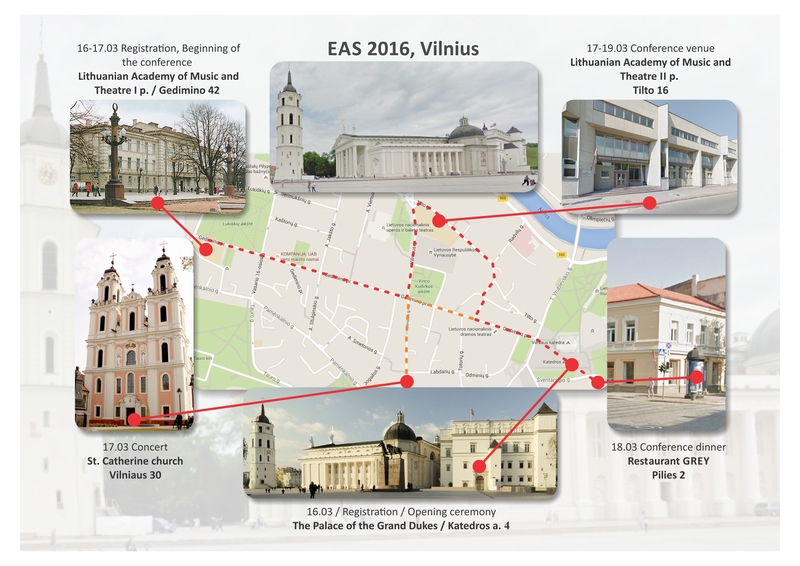 The beginning of the conference will take place in the central palace of LMTA, a 19th century classical building on the main street of Vilnius. Lithuanian Academy of Music and Theatre (LMTA) Building II – a newly acquired venue in the centre of town. The conference will take place there from the afternoon March 17 till March 19. The church of St. Catherine was built in 1743. It is a stone two-tower, one-nave church rich in baroque and rococo style decorations. During the Soviet period the church was a part of Vilnius Art museum. In 1994 restoration works of the church began and it was opened for public only in 2006. The church of St. Catherine is one of main Vilnius concert halls.